Custom Direct Mail Envelopes | Custom Envelope Converting and Printing | Priority Envelope, Inc.
Our dedicated and knowledgeable employees can answer any questions you may have about printing and converting envelopes. Windows (large and small), double windows and special interactive opening devices that appeal to your direct mail customer or prospect. In addition, we can print up to FOUR colors on coated papers. The fastest envelope converters in the world! With speeds up to 1600 per minute, we can complete your project faster than anyone else. Find out more about our quick turnaround and fast delivery. A full array of die cutting, folding and converting. Plus Customized poly patch, latex gum applications, peel and seal...and more! 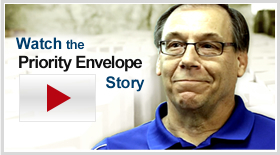 Priority Envelope is a custom envelope manufacturer that provides industry leading service. Our vision is to be the best supplier in your organization! Our dedicated and knowledgeable employees can answer any questions you may have about printing and converting envelopes. We have a significant assortment of envelope converting and specialty equipment designed to provide any type of envelope you may need, from standard commercial envelopes to special custom envelopes for any application.